The EV1000 clinical platform from Edwards Lifesciences presents the physiologic status of the patient in an intuitive and meaningful way. Designed in collaboration with and validated by clinicians, the EV1000 clinical platform offers you scalability and adaptability for both the OR and ICU. 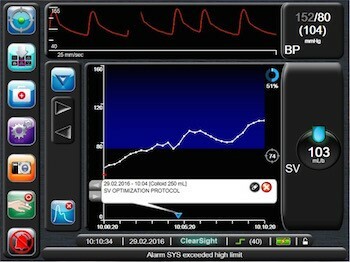 The EV1000 clinical platform enables you to choose the parameters needed to monitor your patients and may be used with a variety of Edwards advanced hemodynamic monitoring tools for an integrated Edwards Critical Care System. The platform may be used with the Edwards advanced hemodynamic monitoring portfolio including the ClearSight finger cuff, FloTrac sensor, Edwards oximetry central venous catheter and PediaSat oximetry catheters and VolumeView set. Based on the complexity of each procedure, and patient risk factors, choose your preferred dynamic and flow-based parameters and the appropriate Edwards' hemodynamic monitoring solution to suit your clinical approach and your moderate to high-risk surgical patients’ needs. The EV1000 clinical platform provides the choice of the parameters you want to view and how you want to view them. 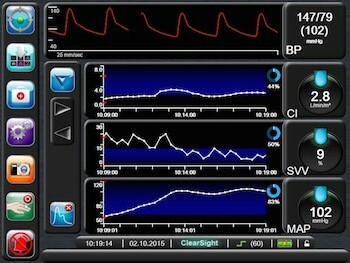 Screen options include the real-time physiology screen (both intermittent and continuous), the cockpit screen, the goal positioning screen, graphical trend screen and the physio-relationship screen. Continuous access to advanced hemodynamic parameters offers immediate insight into patient physiologic status, giving you the clarity to make more informed volume administration decisions to help you consistently maintain your patients in the optimal volume range. Color-based indicators communicate patient status at a glance, and visual clinical support screens allow for immediate recognition and increased understanding of rapidly changing clinical situations to help clinicians make better decisions. The next perspective on guiding volume administration. 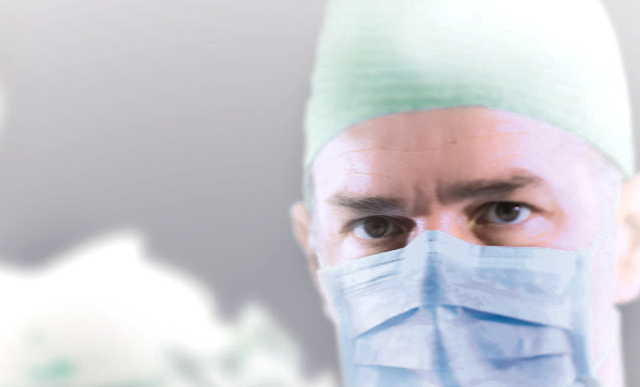 The EV1000 clinical platform offers the next perspective in guiding volume administration. The latest visual clinical support screens available on the EV1000 clinical platform – for use with the ClearSight, FloTrac and VolumeView systems – enable you to maintain your patients in the optimal volume range and reduce volume administration variability. Time-in-Target indicator facilitates Perioperative Goal-Directed Therapy (PGDT) compliance, helping the user to track and manage key parameters, and create and monitor customized protocols. The Time-in-Target indicator represents the accumulated percentage of time a parameter has been within target range during an active tracking session. 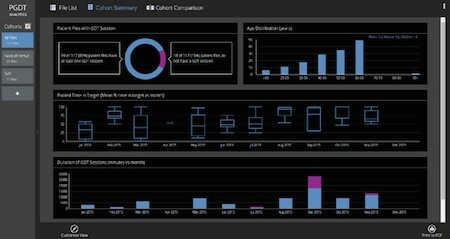 PGDT Analytics is a PC only desktop application that organizes and visualizes data download files from the EV1000 clinical platform. It can be used with the ClearSight, FloTrac and VolumeView Sytems. The EV1000 clinical platform provides the choice of parameters you want to view and how you want to view them. Screen options include the real-time physiology screen (both intermittent and continuous), the cockpit screen, the goal positioning screen, graphical trend screen and the physio-relationship screen. Advanced hemodynamic parameters, when implemented within a perioperative goal-directed therapy (PGDT) protocol, are demonstrated to reduce post-surgical complications in moderate to high-risk surgery patients.16 The FloTrac system provides advanced hemodynamic parameters that can be used in PGDT to control variability in volume administration and help you maintain your patient in the optimal volume range. Stroke volume measurement with the FloTrac system* enables an individualized approach for administering fluid until SV reaches a plateau on the Frank-Starling curve, to prevent hypovolemia and excessive fluid administration. For control-ventilated patients, SVV has proved to be a highly sensitive and specific indicator for pre-load responsiveness, serving as an accurate marker of patient status on the Frank-Starling curve. The Edwards oximetry central venous catheter. Early detection. Proactive intervention. Edwards Lifesciences advanced hemodynamic monitoring solutions offer you dynamic and flow-based parameters to help you detect the symptoms of sepsis early and help guide treatment evaluation. 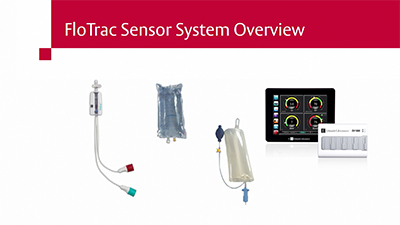 In-service training video highlighting how to properly set up the FloTrac sensor with the EV1000 clinical platform. Edwards, Vigileo Operators Manual: A-4.